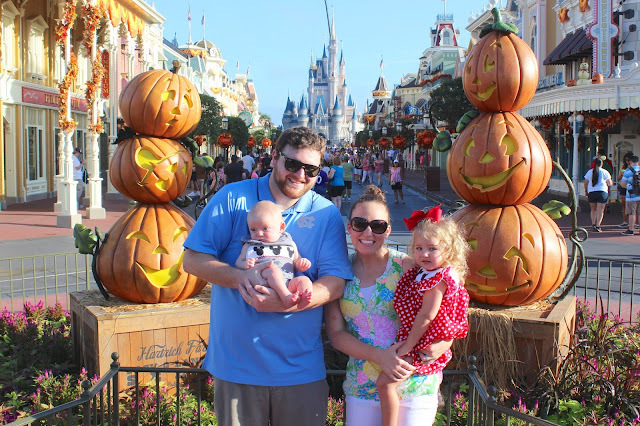 I've done a lot of exhausting things in my lifetime: I was a distance swimmer in college, I've run a marathon and half marathons, I've given birth twice...and now I can add "going to Disney World" to that list of truly exhausting experiences. If you've ever done Disney with kids, you know I am not being dramatic! We are still recovering over here, 11 days later! I originally thought," Oh, we'll just do Magic Kingdom for 1 day, no big deal." Then I started researching and discovered you have to map out what rides to hit when, how to use your FastPasses, etc. (I used touringplans.com as well as their app and it was beyond helpful!!) And then our tickets were over $100 each (but Ella and Lucas were free! 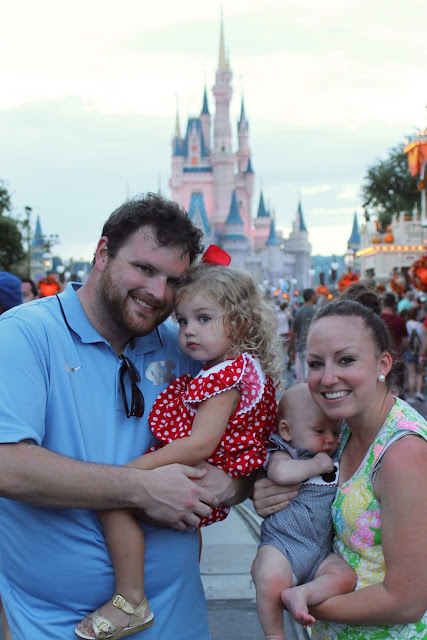 ), so I definitely wanted to get our money's worth during our "just 1 day at Magic Kingdom." 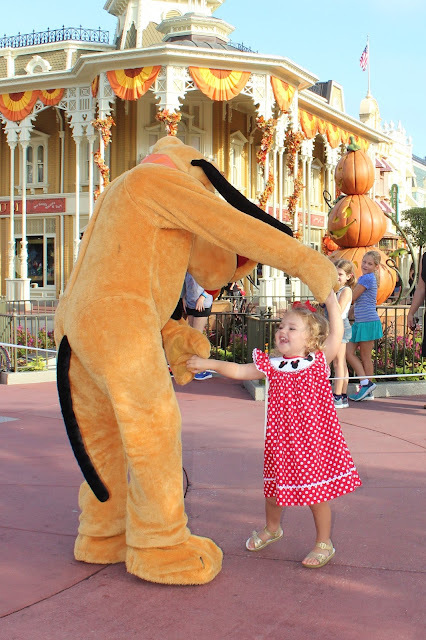 The day we visited had extra magic hours, where they open the park early (8AM instead of 9AM). So, we got up at 5:45, drove to Disney from our hotel, parked the car, walked to the monorail, took the monorail to Magic Kingdom, and were at the front gate before 7:45 AM. Just in time for their little opening show. 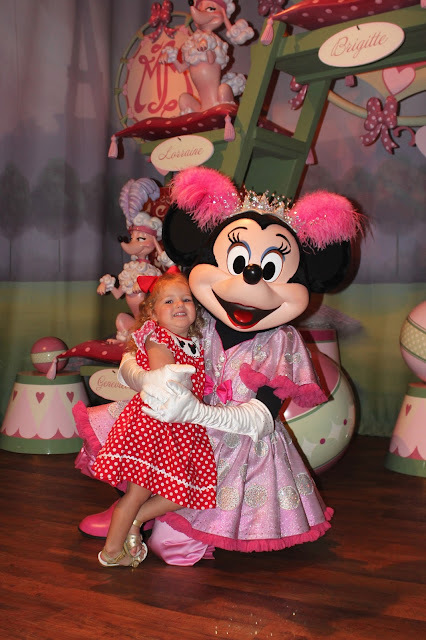 This is so cheesy, but I got a little choked up watching Ella get so excited to be at Disney World! 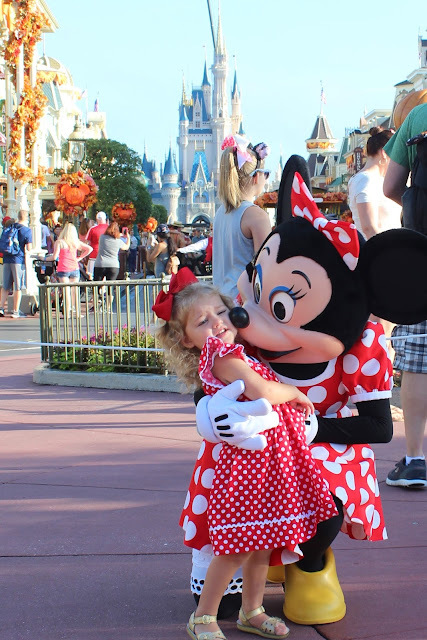 I am not a "Disney person" at all, but it truly is a special place. In fact, I spent most of the day either about to cry tears of joy because my kid was so happy, or feeling like a farm animal being shuffled in and out of different corrals. 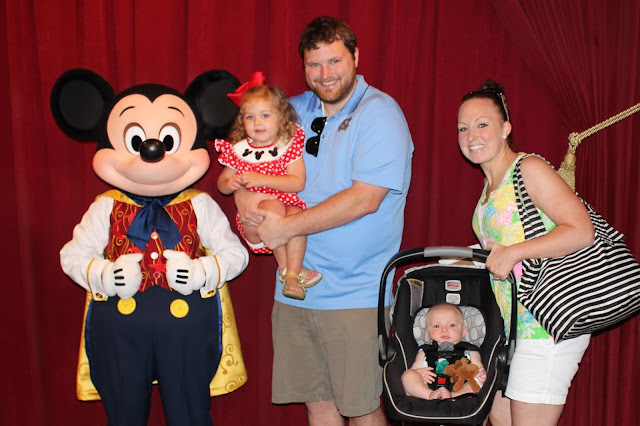 Anyways, once we were inside the gates, our very first stop was to see Mickey Mouse! I chose to FastPass this, but in retrospect, we really didn't need a FP for it because the lines weren't too long yet. Ella just about died. 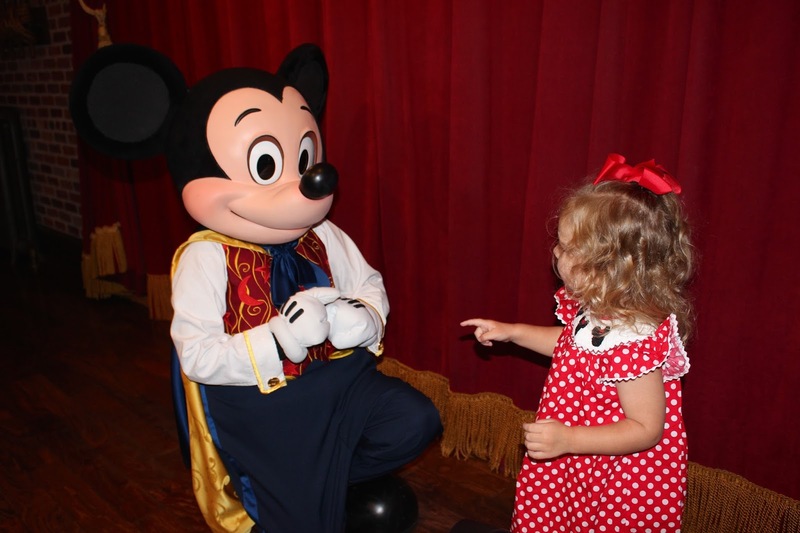 And y'all, this is the REAL Mickey! He talks and everything! Even Trav was like, "Wow, he was the real deal!" 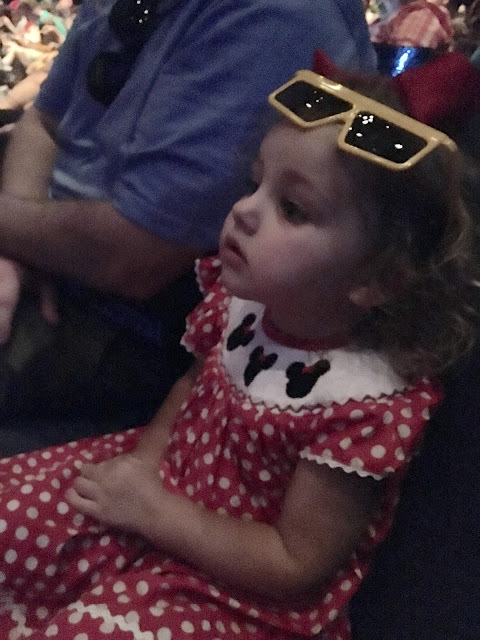 After Mickey, we noticed Minnie and Pluto were in the plaza right outside of where Mickey was, and Ella just HAD to see them. This is where my grand plan of our day totally unraveled. We made it a whole 15 minutes sticking to my plan that I spent hours agonizing over, ha! 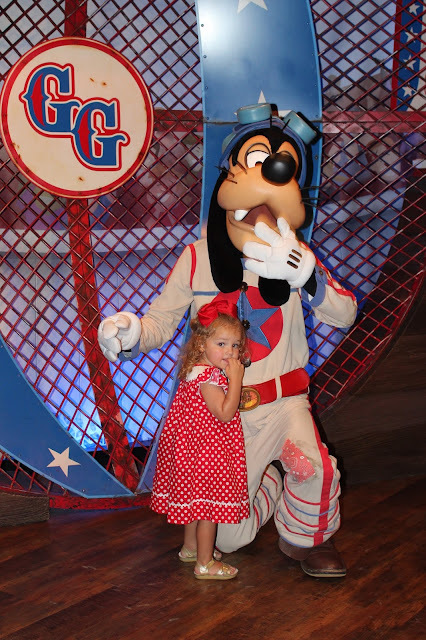 But, we just had to see Minnie and Pluto! We also stopped to get a few family pics before heading to Fantasyland! 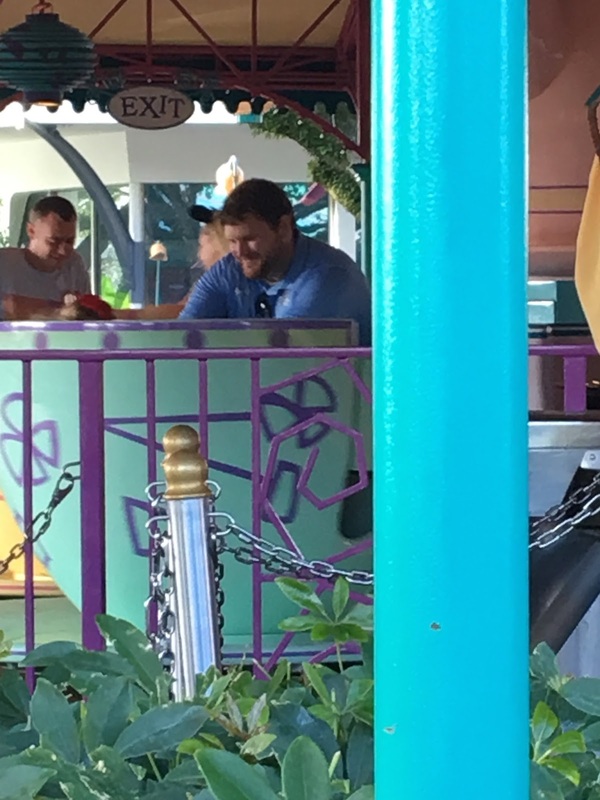 I needed to feed Lucas by the time we got to Fanstasyland, so I sat right outside the spinny tea cups and fed him, while Ella and Trav went on the tea cup ride. Next we went to meet Ariel! 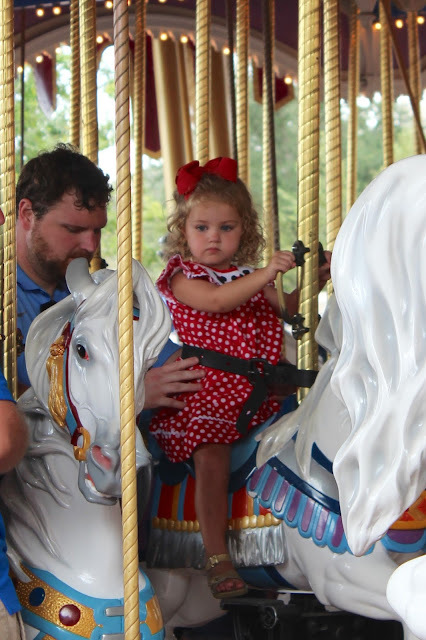 Also: my child looks like she hates her life in pretty much all of these pictures. 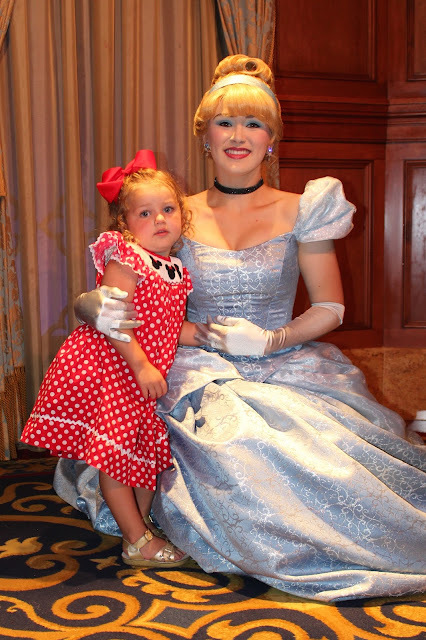 I promise you, she had the time of her life this whole day, and loved meeting every. single. character. She just apparently takes after her dad in the "don't smile in pictures" category! We FastPassed the next ride which was the Under the Sea ride. Again, we probably didn't need to FP this one because the lines weren't long yet (at this point, it was probably about 9:30). Next up: Ella's very first rollercoaster, The Barnstormer! She passed the height requirement by half an inch! Then we went to meet Goofy, Donald Duck, Daisy and Minnie (again). So, the whole time we were at Chef Mickey's the other night, she wanted to know where Daisy Duck was....that was the one character she REALLY wanted to meet that she hadn't yet. 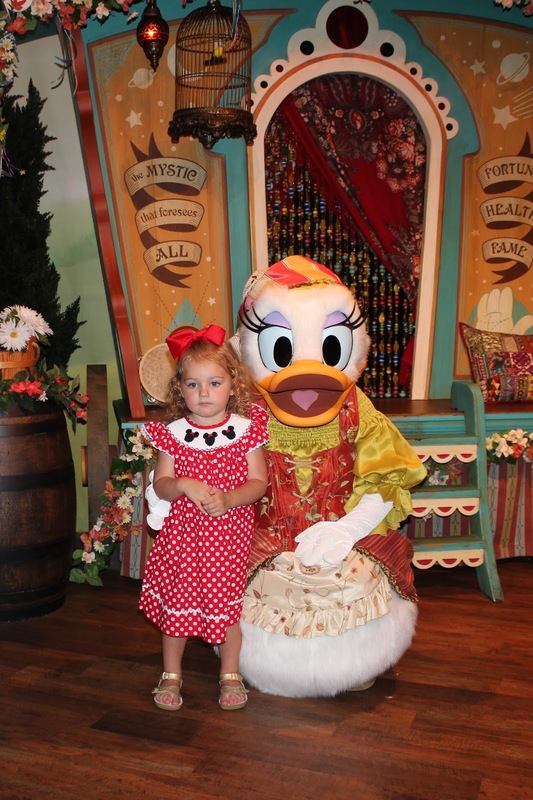 You would think she'd look more excited about finally meeting Daisy! And if you're keeping track...this is now the THIRD Minnie she's met. 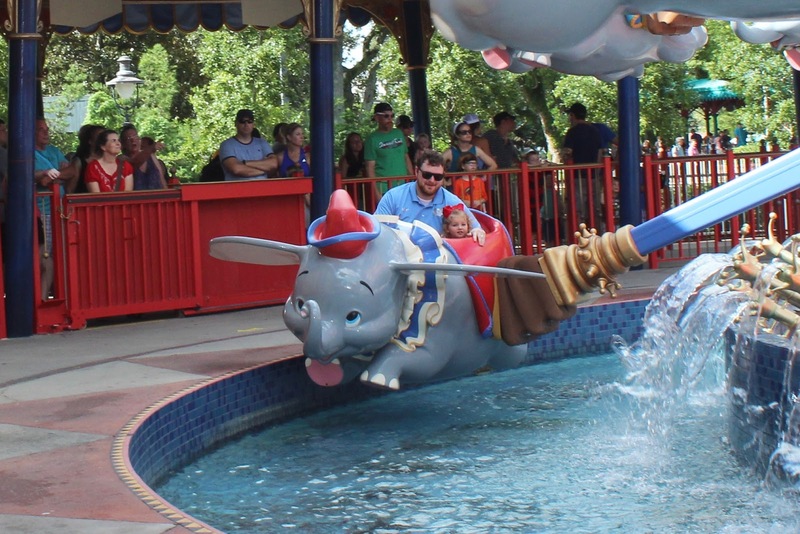 Next Ella and Trav went on Dumbo. Travis told me there was a playground in the line for kids to play on, which I think is so genius! Ella said she liked this ride because it was like Skye from Paw Patrol (insert me rolling my eyes). We used our last FastPass (of the original 3 you get with your ticket) for the Winnie the Pooh ride. At this point, it was about 10/10:30 and the lines for everything were about 20-30 minutes long, so I am glad we used the FP for this! Once we got off the ride, we were able to book another FastPass, so we used the Disney app (this one!) 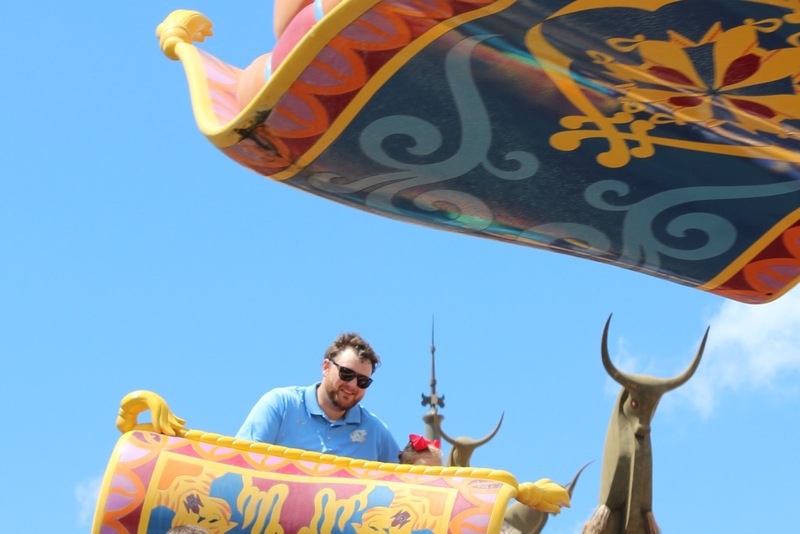 to book a ride on It's a Small World. Ella and Lucas were mesmerized by this ride! While we were still at It's a Small World, we booked our next FastPass (you can book your next one as soon as you use your first FP) for the Haunted Mansion. Yes, the Haunted Mansion. With our 2 year old. We were looking for something close by and available relatively soon (the other FastPasses available weren't until later that afternoon or evening). First, we ate lunch and fed Lucas, and then we headed to the Haunted Mansion, where Ella was terrified, just like I predicted. At this point, it was getting REALLY hot. 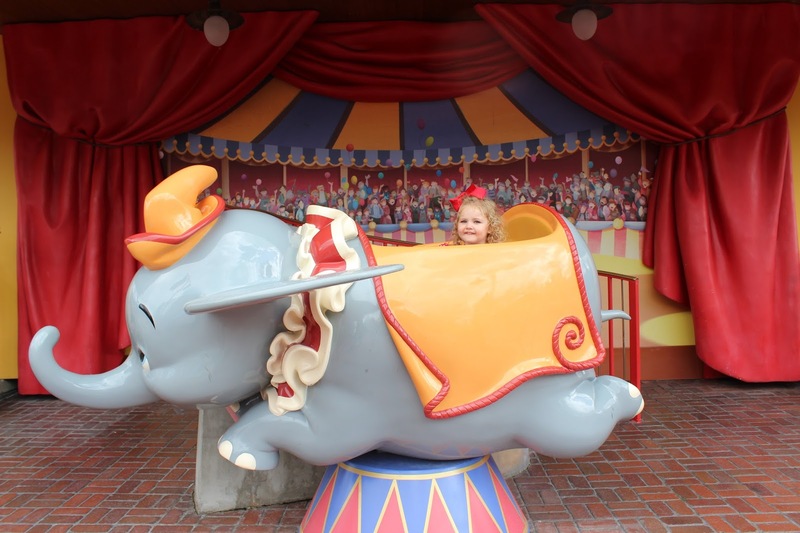 We got another FastPass for the Jungle Cruise, but we had a little extra time, so Ella went on the Aladdin Carpet Ride first. And then the Jungle Cruise. 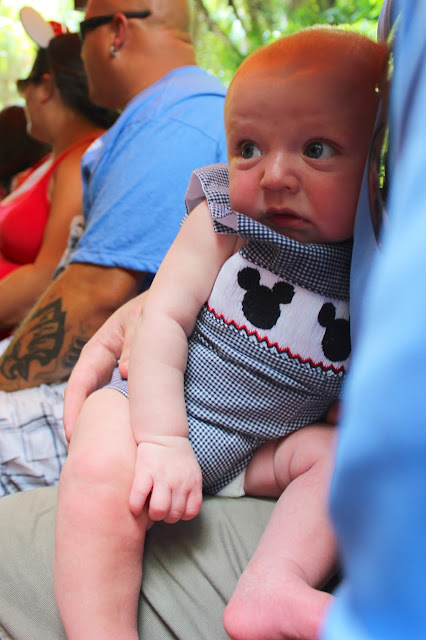 Oh, bless all of our hearts on this jungle cruise. I have never been SO hot in my whole life, and they made me sit in the one little spot that the shade didn't cover...so yes, I was directly IN the sun. Just look at this sweet boy's red cheeks. We were all pretty much dying at this point. Oh, and Ella still had not napped. I think this is when I implemented the "No more rides unless they are in air conditioning" policy! We ducked into the Tiki Room, to get in the a/c and sit down for a minute. After the crazy bird show in there, we needed a major break from life at Disney. I debated just going back to the car, but ultimately, we decided to walk along Main Street and stop in Starbucks. Because, Starbucks always makes everything better, don't they?! Ella miraculously fell asleep in the stroller, and after chugging the most refreshing smoothie ever, I took Lucas to the baby care center to feed him. This baby care place was AMAZING. 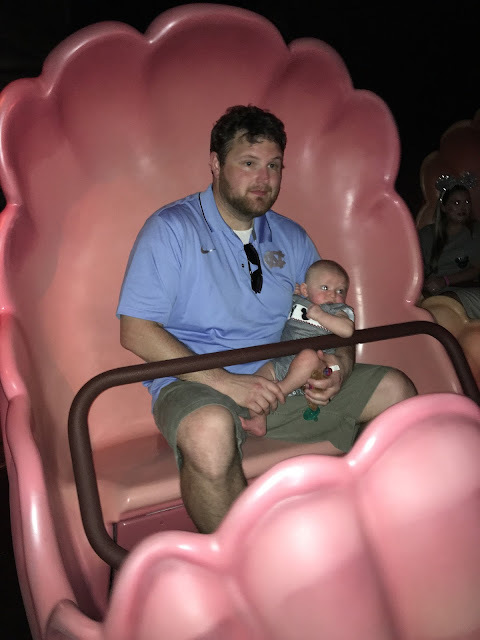 Obviously, it was in air-conditioning (a huge priority in my life at this point), but they also had huge comfy recliners to sit in and feed your baby! It was awesome. I kind of wanted to hide out there all day. 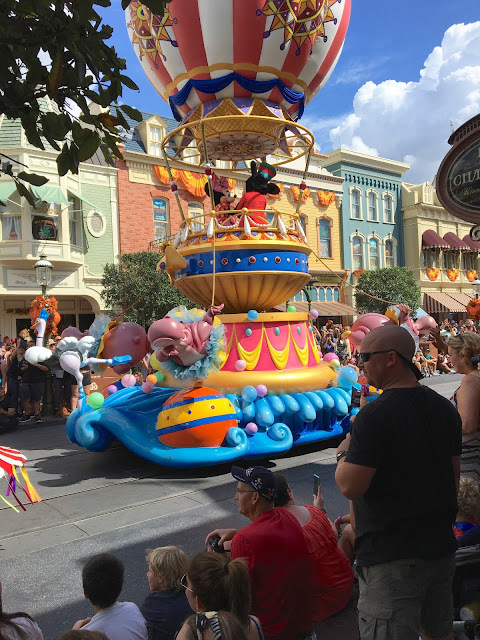 When I finally emerged, I discovered the parade was just finishing! Luckily, Ella had woken up from her glorious stroller nap and got to see most of the parade. 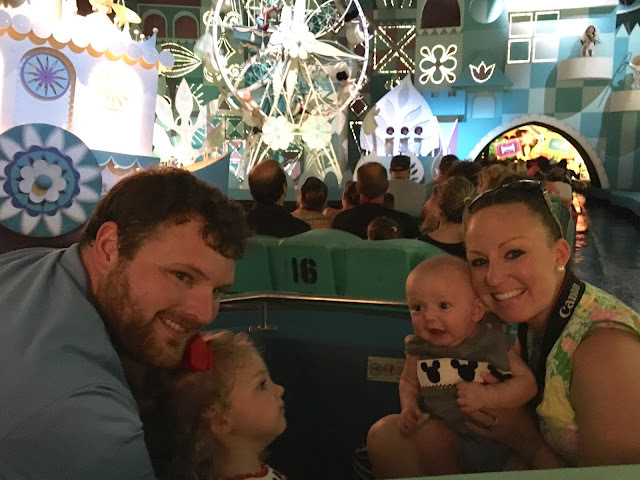 The heat index was still 100* and we still needed things to do that were a) inside and b) required sitting, so we headed off to Mickey's PhilharMagic. I wasn't sure what to expect, but I am SO glad we did this show. You put on 3D glasses and there's a little movie with Donald Duck going through various Disney movies. Ella LOVED it. 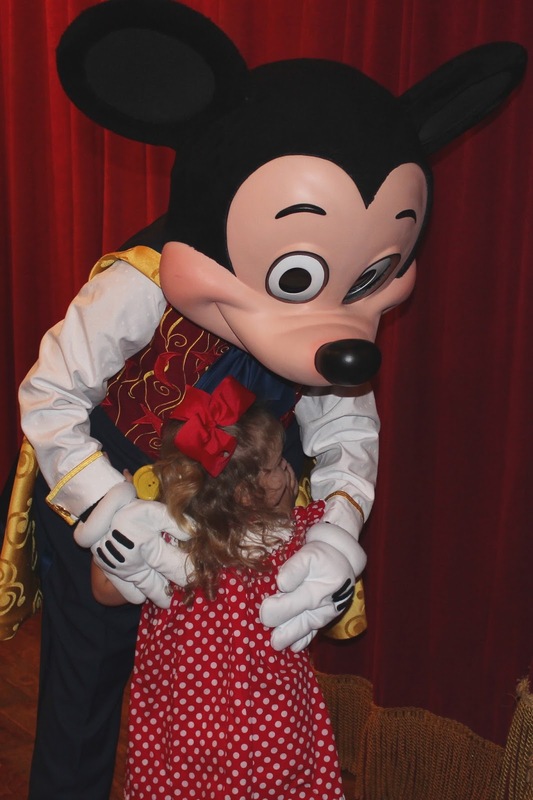 Highly recommend it for any Mickey loving preschooler! We were tempted to just stay in our seats for the next show, but that's not allowed, and plus the carousel was calling our names. After the carousel, it started storming, so a lot of the rides were shut down. Actually, everything was shut down. Thankfully, a lot of people also left. We just kind of walked around (it was barely raining and thundered just once) for a little bit until the rides opened back up. 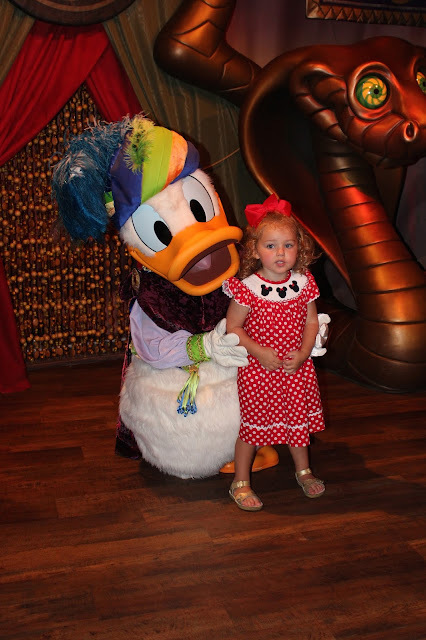 And guess who wanted to go back to Dumbo...AKA Skye from Paw Patrol?! I somehow, miraculously, managed to get a FastPass to meet the princesses at 5:30, so after Dumbo we headed there! One thing I will say about the FastPass system...don't give up if you don't see any good rides/attractions available when you want them. A lot of times, I would just refresh the page and a bunch more options would pop up. 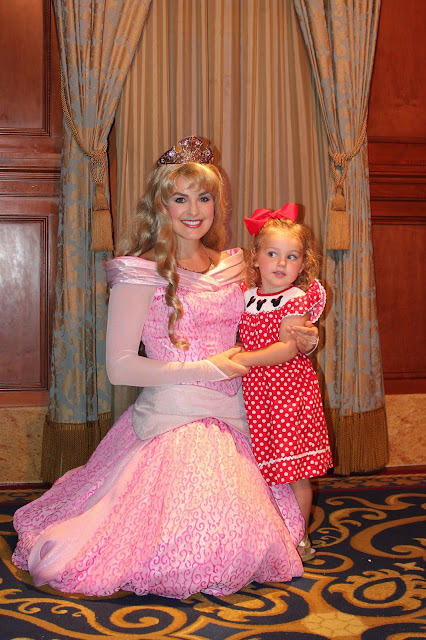 Case in point: these princesses. Earlier in the day, we wouldn't have been able to get a FP for them until 7:30PM. I kept checking and finally saw one pop up for 5:30. So you have to just keep looking. Anyway, Cinderella was with a "surprise" princess, so we didn't know who it would be till we got in the room. I thought it was Rapunzel (I clearly fail at the princess game), but it was actually Sleeping Beauty! Just look at my poor child's sweaty hair. It was SO hot, y'all. SOOOO hot. I have never been so hot in my life. And I live in Charlotte, North Carolina (the most humid place on Earth). Then it was time to feed Lucas again, so I happily retreated to the baby care center for a second time, while Ella stayed with Trav and watched the Move It, Shake It Dance Party. Our next FastPass was for Pirates of the Caribbean (because I was still only wanting to do things inside, ha! ), which I thought might be a little scary for Ella...but she was actually pretty ok on it! I guess once you've survived the Haunted Mansion, everything else isn't too scary. 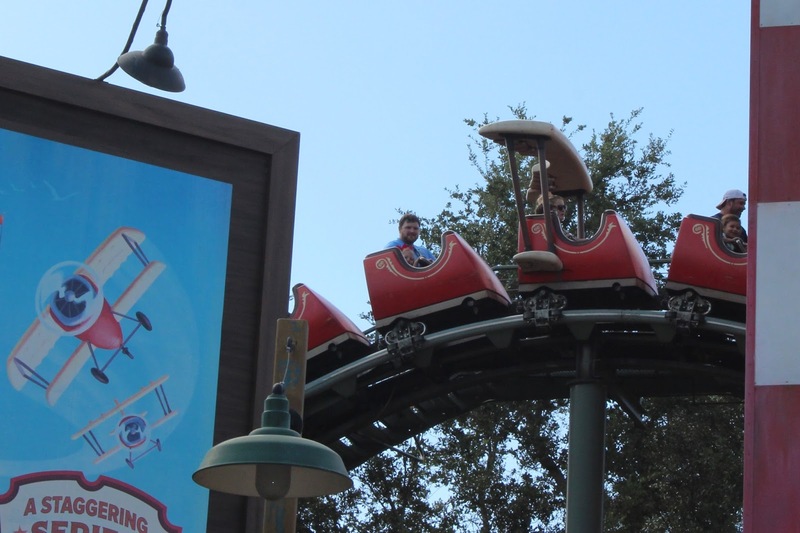 Fortunately/unfortunately, the ride broke down while we were on it! I say fortunately because we were in air-conditioning AND we were sitting down (SCORE! ), but unfortunately, because hello, we were stuck on a ride. Luckily, we were only stuck for about 5 minutes and they gave us several free FastPasses (which, unfortunately, were all for rides we had already been on, but it was a nice gesture). Our last FastPass of the day was to meet Tinkerbell! 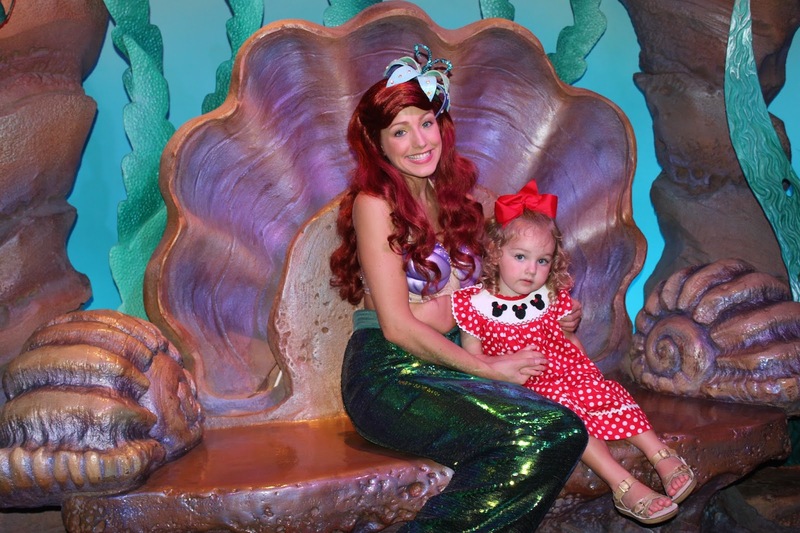 So, I have failed as a parent, and Ella did not know who Tinkerbell was prior to this. But, she LOVED her! 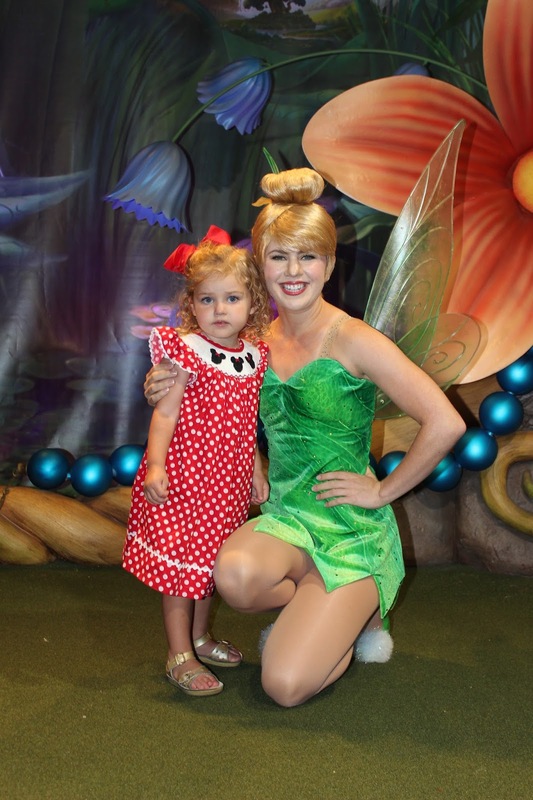 This Tinkerbell was fabulous, and Ella is totally in to all things Tinkerbell now! ...and then it was time for fireworks! We left the park right after that, and stopped at McDonald's for a glamorous dinner on our way back to the hotel. And I have never been so tired and sweaty in my whole life. Not even exaggerating one bit. A magical, fun day, yes...but so hot and exhausting, too. The things we do for our children, right?! If you read that whole thing, congrats!!! You are probably almost as tired as I was after our day at Disney!